A division bench of the Karnataka High Court has ordered status quo on the controversial proposal to comprehensively amend the Municipal Solid Waste (Management and Handling) Rules or MSW Rules 2000. The amendments were mooted by the Ministry of Environment and Forests (MoEF). The court has asked the ministry to explain the reasons for proposing amendments. The division bench comprising Justice N Kumar and Justice B V Nagarathna issued the direction on October 11 in response to a submission filed by the Bengaluru-based non-profit, Environment Support Group (ESG), and Leo F Saldanha, environmental activist and coordinator of ESG, on their public interest petition. The petition is against the Bruhat Bengaluru Mahanagara Palike and others and relates to municipal solid waste management. The submission questioned MoEF’s notification on its website on July 2, 2013, inviting comments on the proposed amendments to the existing MSW Rules, 2000. The proposed modifications to the existing rules are highly retrograde and promote unjust, unscientific and unnecessary techniques of municipal solid waste management, says the submission. The proposed modifications also undermine a series of progressive directions issued by the Karnataka High Court, the submission has pointed out. The petitioners brought to the attention of the court that the proposed amendments by the ministry promote dumping of unsegregated waste in landfills. Besides, the petitioners have argued that the intention of the amendments appears to be actively promoting incineration technologies for burning unsegregated waste, which violates the existing rules. There are a few writ petitions and public interest litigations related to municipal solid waste management in Bengaluru specifically, and Karnataka in general, pending before the court. In the writ petition 46523/2012 filed by ESG, MoEF is the third respondent. Notice has been issued, and the date of appearance for the ministry was marked way back in November 2012. At no point in these ongoing proceedings has the ministry filed any objection to any of the writ petitions, or even expressed its intention of modifying the existing MSW Rules, say the petitioners. “We are shocked that the ministry has undertaken this exercise entirely in a secret manner, choosing to keep even the judiciary in the dark on the proposal and not just the ordinary citizens of the country,” says Saldanha. According to the petitioners, the proposed amendments appear, prima facie, absolutely against the letter and spirit of the unprecedented and progressive directions related to the solid waste management issued by the Karnataka High Court. It is through these directions that the existing rules are being enforced in Bengaluru and other parts of the state, point out environmental activists. 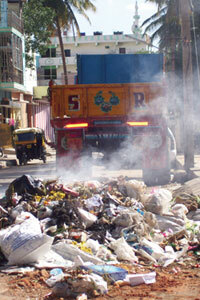 The thrust of the directions by the court has been to enforce segregation of municipal solid waste at source; transport such segregated waste in a scientific and just manner to transfer stations in each and every ward of the urban area (land has been identified to establish at least three such stations in every ward in Bengaluru city); promote composting or bio-methanation of biodegradable waste locally, recover recyclable waste by engaging various civil society and entrepreneurial partners; and to ensure only that waste which is inert and has no further use is transported to scientifically designed landfills. “The court has also repeatedly expressed its keenness to ensure that the cities do away with landfills, except when absolutely essential and with all necessary safeguards,” points out, Bhargavi S Rao of ESG. All these directions were based on the MSW, 2000, and the ministry’s proposed modifications are against these directions. During the hearing of the cases related to waste management, the court had commented that mismanagement of municipal solid waste was a direct result of the lack of transparency in municipal administration, poor choice of policies such as outsourcing waste removal, disposal and landfilling to private contractors, and lack of accountability to the public. The court has strongly felt that it is necessary to enforce direct involvement of citizens in civic affairs by forcing the state government to institute ward committees as a measure to plan, manage, monitor and regulate various municipal projects, particularly garbage management, as is required by the 74th Constitutional Amendment, the Nagarpalika Act. Under the directions of the high court, the state government has proposed a new legislation, the Karnataka Municipal Corporation (Ward Committee) Rules, 2013, point out the activists. Various civil society groups and environmentalists have already submitted their comments on the proposed Act. At this stage, seeking to amend the MSW Rules without bringing it first to the notice of the court, especially while the ministry is a respondent in the pending cases, amounts to undermining the authority of the court, argue the petitioners. “It is a matter of utmost impropriety on the part of the ministry to have resorted to such actions is contrary to the purpose and import of the directions issued by the court in the pending cases,” says Sunil Dutt Yadav, the lawyer of ESG. The court has directed the additional solicitor general representing the ministry to appear for the next hearing scheduled for 24th of this month. The ministry will have to explain why it has proposed the amendments to the MSW Rules 2000.